DURHAM, N.C., October 16, 2018-- On the heels of its acquisition by Ford Smart Mobility LLC, TransLoc, a provider of innovative municipal microtransit and campus transit technology solutions, today announced the company will organize into three primary business units going forward - Municipal Mobility, Campus Mobility and Mobility Information. Effective immediately, this reorganization is intended to accelerate market growth, optimize operations and continue to deliver a world-class customer experience. These three newly established, integrated teams will enable TransLoc to accelerate activities and deploy the right expertise to deliver a broad suite of highly-targeted mobility solutions to cities, transit agencies and campuses. Municipal Mobility. With microtransit customers in more than 50 cities across the U.S., TransLoc has partnered with more municipal transit agencies to roll out flexible, on-demand services than any other provider in the market. Campus Mobility. TransLoc is reinvesting millions of dollars in its university business with the creation of the Campus Mobility business unit, now serving more than 100 campuses nationwide. TransLoc is doubling down to offer the best technology and services available in the university and business campus transit market. Mobility Information. One of the biggest needs for transit agencies today is access to actionable data and information. TransLoc’s new Mobility Information business unit has been formed to provide products and services that enable transit agencies to do much more with the data they have, starting with new ways to create, store and manage these valuable resources. Hailed by Fast Company as one of the world’s most innovative companies in transportation, TransLoc, a Ford Smart Mobility company, is the technology provider of flexible agency-owned microtransit solutions and transit solutions for university and business-style campuses. TransLoc is enabling transit agencies nationwide to remain central to the future of modern transportation. TransLoc has partnered with hundreds of municipal and university transit agencies to reach a higher level of service and win the confidence of the riding public for more than a decade. TransLoc is also proud to be a Google Partner. 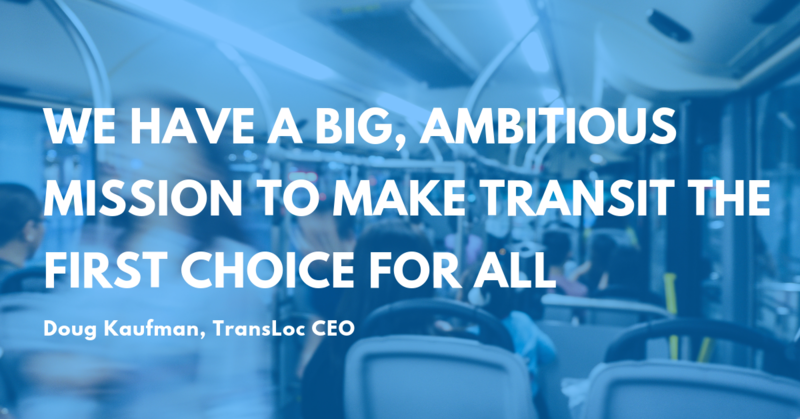 To learn more, visit TransLoc.com or follow us on Twitter at @TransLoc.